Last Veteran’s Day, CNN’s chief Washington correspondent Jake Tapper released The Outpost: An Untold Story of American Valor, telling the story of Combat Outpost Keating — a remote American outpost in the Hindu Kush mountains of eastern Afghanistan. A year later, the book’s tale of the soldiers who built, manned, and defended Keating is as resonant as ever, reminding us that after more than 12 years at war we still have troops demonstrating uncommon valor in some of the most desolate environments on Earth. The narrative of The Outpost follows the evolution of Combat Outpost Keating, from its troubled birth early in 2006 to its tragic end in 2009, when the U.S. military suffered one of its worst days of the Afghanistan conflict. The story is told through the eyes of the soldiers of the 3-71 Cav, the 1-91 Cav, 6-4 Cav, and the 3-61 Cav that called Keating home. Few details are spared as Tapper catalogues the truth of war with a stark, matter of fact tone. Bullets tearing through flesh, the impact of rocket propelled grenades, and the grisly aftermath of improvised explosive device detonations are described in a level of detail that is chilling in its terrifying simplicity. Importantly, Tapper also delves into the impact Keating had on those who were connected to the outpost in some way, whether through the story of a veteran suffering from PTSD or the grief of families who are told their loved ones will never come home. The incorporation of these stories reminds us of the true impact and reach that war continues to have. The Outpost closes with a somber, retrospective tone. While Tapper describes the inevitable investigations and reports following the tragic final chapter of Combat Outpost Keating&apos;s troubled story, the reader is painfully reminded of the immense human cost masked by the bureaucratic language of Washington investigators. Turning the final page, the reader is left with a mixed feeling of great loss and extreme frustration. The Outpost is not a joyful read, but it is an important one. In a story that saw the unbelievable heroism of dozens of men demonstrated time and again, the reader can’t help but always be drawn back to the question of why these men were ever put in there in the first place. In this questioning of motive and execution lies the truly important message of Tapper&apos;s The Outpost; that even where the motives and leadership of decision makers can and should be questioned, the unimpeachable dedication and sacrifice of our soldiers should never be forgotten. I was fortunate enough to have a chance to speak with Jake Tapper and discuss his thoughts on The Outpost a year after its release, discussing the importance of the story and it&apos;s impact. The following is an edited transcript of our conversation. Mark Kogan (MK): The book itself spans a really massive scale, telling the story of Combat Outpost Keating from its inception to its tragic ending and aftermath. You mentioned in other interviews that the original idea was to write the story of the Battle of Kamdesh Pass and that the story just grew from there. You mentioned in an interview with NPR learning about it almost by accident, seeing it on TV while holding your newborn son. What made you decide to take that deeper dive to tell the story of Combat Outpost Keating in the detail you did? Jake Tapper (JT): I can’t really explain the decision-making process because it was just one of those situations where something just gnaws at you. It was happenstance. My son had been born October 2, 2009 and the attack on the outpost was on October 3, so it was random that I just happened to be in the hospital and holding my son and, since I’m naturally a news junkie, paying attention sporadically to the little TV at the hospital. I saw this report and it just gnawed at me because the coverage in the media was, accurately so, about how vulnerable the men at Combat Outpost Keating were — how they were at the bottom of three steep mountains, close to Pakistan, and how they were, in the view of many, sitting ducks. Just as a news consumer, I waited for someone to explain to me why they were there. And no one ever told me. I would Google the name of the COP and read the few follow up stories reported. A few months later, the Army finished its official report, which focused mainly on the previous few months and not the full history of why the outpost was put there. Eventually I started making phone calls because I was interested in learning more about why this camp had been put there. I ultimately became so interested that I pitched a book. Originally it was just going to be about the last company to serve at Combat Outpost Keating in 2009: Bravo Troop, 3-61 CAV. That changed because other troops who had served there heard that I was writing this book and reached out to me on their own and ultimately convinced me to make the book not just about those final few months but about the whole history of the camp and not just to write about the eight men killed at that camp in 2009 but the others who had been killed in 2006, 2007, and 2008. It was the desire of these troops to have their stories told and to have their friends memorialized that pushed the book to be more ambitious and much longer than I originally intended. MK: In the author’s note, you mention that you faced the difficult choice of “deciding how honest to be about the horrors of war.” You mentioned that you had to do research to even begin to understand the effects of weapons like RPGs on the human body. From my reading, it doesn’t seem like you pull too many punches in describing what these men experienced. What role do you feel telling the types of stories you told in The Outpost, with that attached level of detail about the horrors of war, have in society? JT: I talked to a lot of people. I sought the advice of other journalists, including Bob Woodward. I spoke with troops and family members. Ultimately, I settled on a decision to withhold some information on specific injuries but not much — because I think we sanitize too much, we in the media. The American people seem to want it that way, we don’t want to know about the true costs of war, we change the channel or don’t buy the newspapers. Our war coverage in the U.S. is different from war coverage in other countries. Other countries offer much more graphic coverage of what war actually means. I thought it was important, since the book in so many ways was about honoring and respecting the sacrifices being made, for the book to really explain what those sacrifices meant and that meant explaining what it meant to Dennis Cline when his hand got blown off, or explaining what it meant when Captain Rob Yllescas died, a month after a radio controlled IED went off and blew him up. One of the things that a lot of these troops and their families want to talk about is what these sacrifices actually mean. One of the interesting discoveries writing this book was when I found the blog of Captain Yllescas’ widow, Dena. She had a very detailed daily blog about everything she went through; from the moment she heard that her husband had been injured to his death and beyond. Something that still haunts me is the story of when Rob and Dena’s daughter finds out that her dad had lost his legs and would be wearing prosthetics. She already knew about prosthetics because a family friend who Rob served with in Iraq already has them, and she talked about wanting to paint her daddy’s prosthetic legs peach because she wants them to look like actual legs. And you know, that’s just the reality of life for a six year old whose dad is in the Army these days. It was stunning to me. And, since I consider myself kind of informed — I was covering the war as a senior White House correspondent, I had been to Baghdad covering the war in Iraq — I felt that it was something that people would benefit from hearing about. MK: Kind of building on that, I remember that during the Afghanistan/Iraq conflicts, there was a famous picture that was circulated of a white board in a Marine outpost in the Middle East. 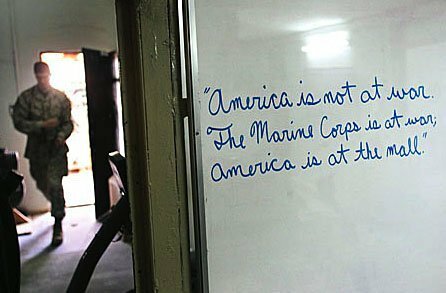 Written on the white board was the phrase, “America is not at war. The Marine Corps is at war, America is at the mall.” To what extent do you think that apathy still exists and what role do journalists like you and story’s like The Outpost have in disrupting that perspective? JT: A lot of troops feel that way. There’s a section in the book where a young Lieutenant named Dave Roller, who has just lost his Captain, Tom Bostick, and has lost other friends, ruminates on the fact that most of the American people cared more about Paris Hilton at that moment than they did about what he and his friends were doing. I think that detachment is a big part of our country right now. It’s easy to blame it on the media. And we should be blamed to a degree. But if the American people didn’t change the channel and didn’t not buy the magazines and didn’t not buy the newspapers then the media, which is a commercial enterprise, would provide more war coverage. I’m not saying it’s right but it’s just a fact. I think part of it is a reflection on the fact that it’s so unpleasant and the war has been going on for so long. I also think part of is that nobody has any skin in the game except for the one percent who serve and their families. There’s a general in the book who did not want to be named; he hoped that the book would change the distance between the public and those who serve. Wars are launched and nobody in society except for this one percent sacrifices in any way. I’m not calling for a draft or for higher taxes, butI just don’t think it’s sustainable for the current dynamic to continue, where one percent sacrifices so much and the rest of us stay so oblivious. There are pockets of Americans who make it their mission to not be oblivious but, generally speaking, as a society we say “thank you for your service” when we see someone in uniform at the airport and then we go to Chili’s. I think it is a huge responsibility for people like me to try to bring some awareness and recognition to these individuals. When I was White House correspondent I did it to the degree I could, then as an author I did it with the book and now on my show at CNN, I try to do it at least weekly, one way or another. We’ve done two documentaries on two of the guys in the book who were awarded the Medal of Honor, Clint Romesha and Ty Carter, and we’ll look for future opportunities to keep telling their stories. Jake Tapper’s The Outpost: An Untold Story of American Valor is published by Little, Brown and Company, New York.